The New India Assurance Company Ltd is one of the leading Public Sector General Insurance Company and wholly owned by Govt. of India. The company invites applications from all over India for the recruitment of Assistants. Candidates satisfying the eligibility conditions are invited to apply online for the New India Assurance Assistant Recruitment 2017. Candidates applying for this vacancy must possess a Graduation Degree from a recognized university and should be familiar with the Regional Language. The age limit of applicants applying for this post must be between 18 – 30 years. However age relaxation rules will be applicable for reserved category candidates like SC, ST, OBC, PWD and EXSM as per the rules mentioned in the official advertisement. Candidates shortlisted from online examination will be called Regional Language Test. Detailed Procedure is mentioned in the official notification which is attached below. 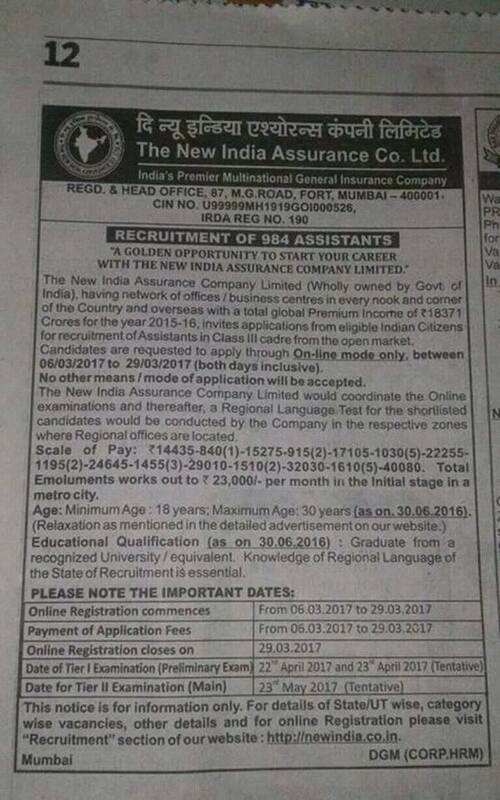 Refer Official Notification of New India Assurance Assistant Recruitment for Application Fee for various categories like SC, ST, OBC, PWD and EXSM. what does it mean by “should be familiar with regional language”?